Our whole team is in high spirits as Hashtag Interactive has once again been chosen as the digital agency of the Singapore Airshow 2018. It’s the third time we’ve been given this opportunity, and we’re pulling out all the stops to make the 2018 show’s digital presence even stronger than the last two editions. When the Singapore Airshow team first hashed it out with us for its fourth edition back in 2014, we knew we had our work cut out for us. It’s one of the world’s most important aviation events after all, and every two years it brings together members of the aviation community from all over the world. The show draws big crowds as well because of its breathtaking aerial acrobatic exhibitions. There was a lot on our to-do list, so we fastened our proverbial seat belts and began developing a digital strategy that will engage aviation fans and generate hype for the event. For the Singapore Airshow 2014, we did an overall of the event’s content strategy and refined its social content to facilitate conversations and engage fans. Aside from having posts that featured information about the event, we also started introducing more varied content types like aviation facts, figures and trivia, relatable quotes and countdown posts. When Hashtag got appointed for the second time in 2016, the bar was set higher, and we wanted to take our previous efforts to the next level. We created even more content that put the show’s ambassadors, Captain Leo and Captain Leonette, in the front lines. To strengthen brand recall, we improved the look and feel of the page with design elements that fans could easily associate with the event. We added more interactive contests to the Facebook page as well. Working with the Singapore Airshow in the past couple of years has been such a blast. We’ve gained valuable insights on what it takes to successfully create social media buzz for an event. We had fun creating posts with Captain Leo and Captain Leonette, as the duo’s interesting backstories presented a lot of possibilities to get creative. Of course, our team also enjoyed learning about the fascinating world of aviation. Another thing we love about the whole experience is having the chance to interact with the event’s followers. Probably one of the liveliest audiences to engage with, aviation fans have high levels of enthusiasm when responding to posts and messages. Plus, they get so excited when their aviation knowledge is put to the test. Aside from the Singapore Airshow, we also get to connect with aviation fans through our three other accounts from the aviation industry: the Civil Aviation Authority of Singapore, We Are Aviators and the Singapore Airshow Leadership Summit. 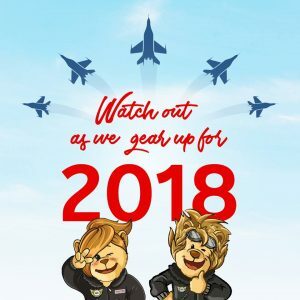 Hashtag Interactive has grown alongside the Singapore Airshow, and you can bet we’re taking all the lessons we’ve learned throughout the partnership and keeping them in mind as we work on the 2018 show. Watch out as we continue taking the Singapore Airshow’s social media campaigns to new heights!